How do you know who is going to provide you the best external house washing service? How do you know who to trust? 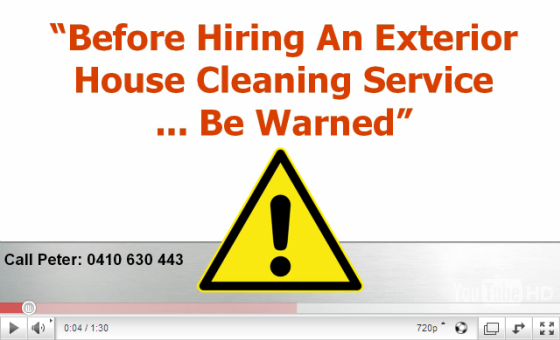 How do you choose from all the external house cleaning contractors out there? You see, you don’t have to say “yes” to the lowest price. Because your home is one of your largest investments – Exterior House Cleaning recommends that you make sure the people you invite into your home treat you and your valuable asset with respect. Exterior House Cleaning offers you a no obligation free quote and we guarantee you’ll receive honest advice and the best value service for your investment. For a free quote on all your exterior house cleaning, call Peter on 0410 630 443.